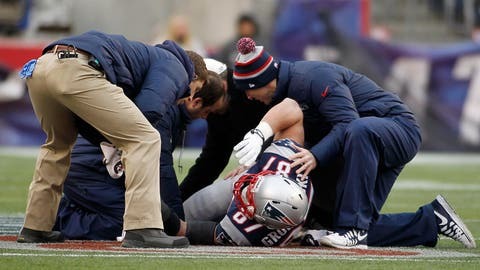 Patriots tight end Rob Gronkowski left the game in the second half against the Browns on Sunday, when he took a shot to his right knee while going for a pass from Tom Brady. As you can see, Gronk had his eye on the ball when he was hit low by safety TJ Ward. His knee buckled and he went down in a heap. Trainers immediately called for the cart and the big man was taken to the locker room. There’s no word yet on the severity of the injury, but it obviously doesn’t look good.